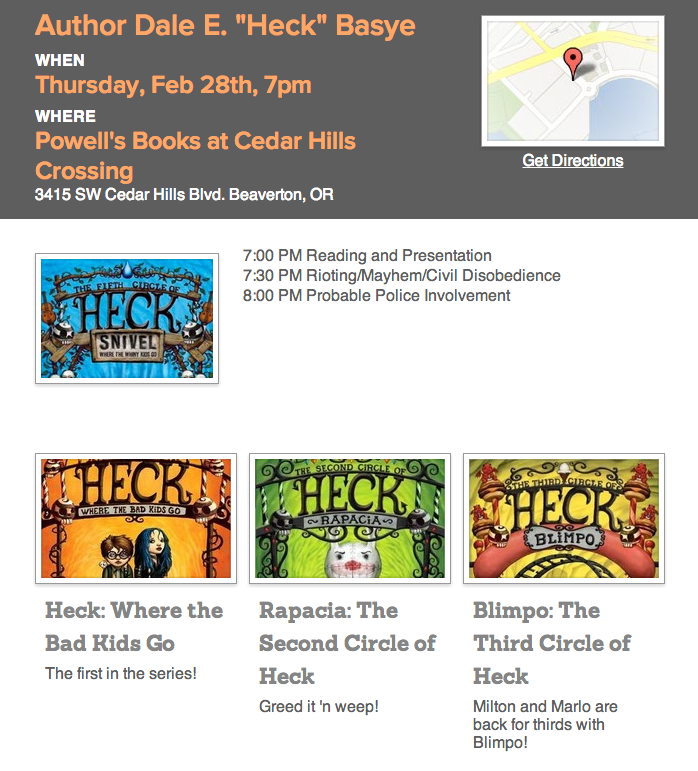 Heck @ Powells Cedar Hills Thursday, Feb 28th, 7pm! 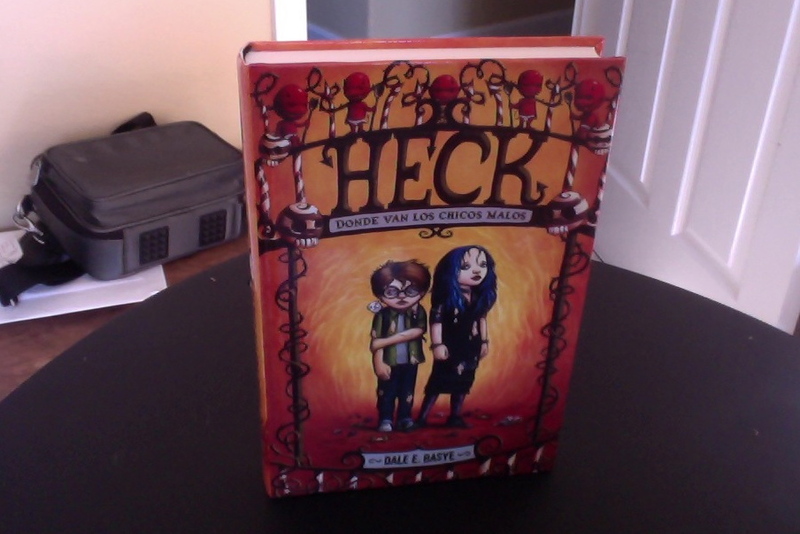 New Ways to Let All Heck Loose! 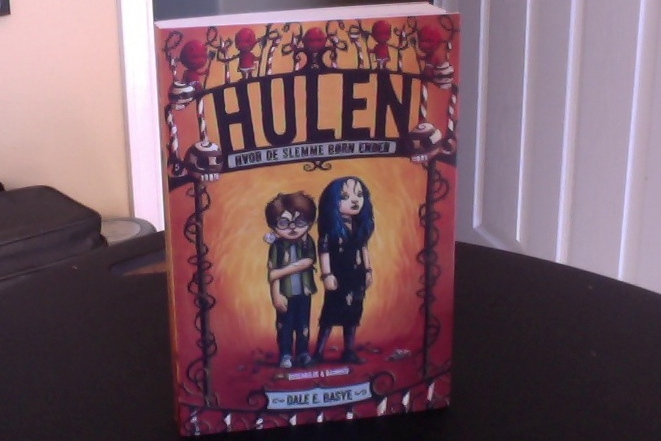 • and the Danish version of Heck called Hulen, translated by the wonderful Soren Kristensen, available wherever odd Danish children’s books are sold. A squalid, crowded miserable peasant hovel. A wretched old woman, GWENDOLYNN SKELDERGATE, opens the door of her equally wretched Medieval hovel. It is crowded with rats and relatives. Oh, Tybalt the Tonsor, how good of you to come! Worried, were we! The Penny Pie Turnpike was murder. Literally, they killed my coachman. Luckily my horse, Van Gelding, knew the way, what with you losing so much of your family recently. Aye, God Hisself mustn’t be too happy with we Skeldergates. We’ve lost a lot of limbs on our humble tree. Can I take your coat? Mum, is Uncle Kargeth going to be okay? That’s for the Tonsor to decide. But I’m sure he’ll be fine. It’s not like it’s the plague or anything. He’s in so much pain. Isn’t there anything you can do for him? Of course! I am a professional doctor, barber, dentist, and—for a poultry sum—a certified chicken inspector. I’m sorry if I insulted your credentials. I’m just a your average, run-of-the-mill teenage mother with sixteen children and a life expectancy of about two more months, God willing. Yes, well I want Uncle Kargeth to take a hundred leeches, externally, for two weeks. Side effects could include, well, having less blood since that’s what leeches do—drink your blood. Side effects could also include sudden death or feeling pretty good. It could really go either way at this point. Here, take this Luggard’s-brand Leeches pen and tote bag. I’ve got tons of them. Now about payment…what insurance plan do you have again? So…will Uncle be with the angels soon? Mmm…angels might be overstating things. But he will be in a better place. I mean, the odds of the place—any place—being better are incredibly high. That was brutal. All that huffing and puffing. You’re the man of the house now, Ulric. So I suppose it’s time. —Your aunt and I are very proud of you and now—as the man of the house— it’s time for you to inherit the family treasure. Treasure? We have a treasure? All this time we lived like pigs and we had a treasure?! I wish I was a pig! Then if I got sick, I could be cured and become bacon! Here you go, little Ulric. An empty jar? 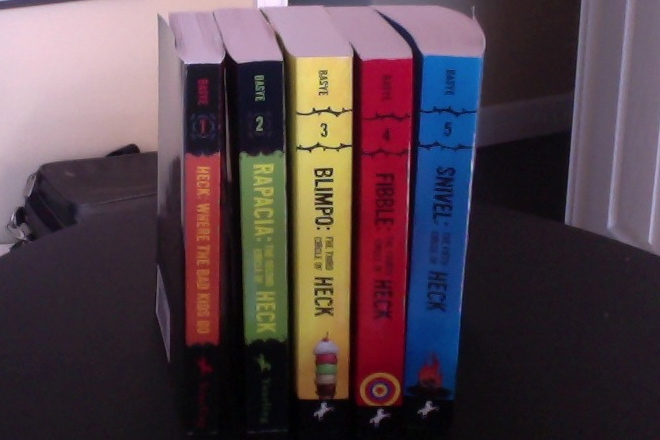 This is my big inheritance? I get the idea. So this jar contains their last gasps? No, not exactly. More like their last…gas. Why…why would anyone save their farts in a jar? Much less leave it as some kind of inheritance? I…I don’t know, really. It’s a Skeldergate thing I guess. They’ve just been passing wind and passing it on when they passed on for generations now. Eeeewww…it smells like the Quorum of Elders. Full of old farts! Maybe the tradition comes from Pythagorus. He’s not a what he was a who. The ancient Greek philosopher. Pythagoras sought to interpret the entire physical world in terms of numbers and founded their systematic and mystical study. He is best known for the theorem of the right-angled triangle. He also thought that by eating beans you might accidentally fart out your soul and die! They can’t all be home runs, now can they? Okay, then. So what am I supposed to do with this dumb jar? Save it. Cherish it. And, whenever you are feeling alone in the world, just think about this connection you have with your ancestors. Or, Pythagoreanly speaking, their souls. Yes! Hopefully it will give you comfort in these dark ages. Interesting. There are always so many rats in homes struck by the Black Death. Rats must be innately compassionate and can sense the plague festering within those stricken. Perhaps I’ll see about prescribing rats in my patients’ homes, to help detect and ward off disease. You are indeed brilliant, squire. That is probably why you’re the hamlet’s leading barber-slash-dentist-slash-doctor-slash-chicken inspector. Father, grandfather, uncle…I wish you were here. I mean, not just your stinky farts in a jar. You know, as long as there’s someone alive to remember you, you’re never really dead. Questioning the world around you is like digging a hole in your brain that aches to be filled. You just have to be careful that people don’t dump their trash in it. How did you get to be so smart? Girls can’t go to school. You know, because their brains are frail and bad spirits would posses them if they knew things. I just keep my eyes and ears open. That way, the whole world is school. 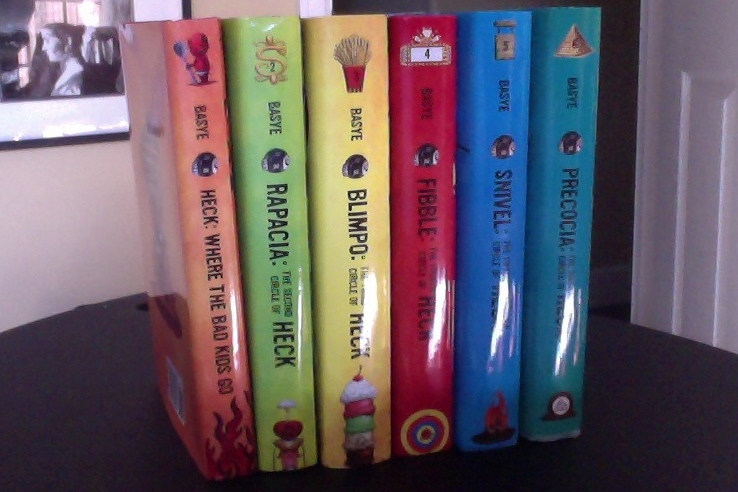 But there’s just so much…yuck in the world. Most of the time I just feel like shutting my eyes and ears. How can you keep yourself so open? Love. That’s how we keep ourselves open to the world without the bad stuff getting to us. I mean, what would we be without love? I guess we wouldn’t be at all, really, if the animals in the barn are any indication. (sigh) I just don’t know what to do. It’s such a big responsibility, being the head of the family and all. And I guess I should be touched that I have my ancestors here in a stinky jar, but I’m not. It just seems wrong. And that all I’ll end up being is a fart in a jar some day. Of course I do. They’re me, in a way. Then, logically speaking, if they are you, then they’re always with you, right? That’s very enlightened of you. It’s not like Medieval London could smell any worse. Should we be laughing when the Black Death just visited our family? At least death reminds you that you only have so much time to laugh. Only so much time to be a kid. Yeah, only so much time to be a little fart. Maybe. But the world sure is flatulent. Good one!…and we all fall down!